On the morning of July 14th, 1789, a group of craftsmen and salesmen had had enough of the arrogance and tyranny of the French King Louis XVI and ransacked Les Invalides for weapons. The mob stole 28,000 rifles there; however, they could find no powder. The crowd knew about a stockpile in the Bastille, a prison that was a symbol of the King’s absolute and arbitrary power. So they decided to attack it. These 80 “invalides”, veteran soldiers wounded in the field, and around 30 grenadiers from the Swiss mercenary regiments attacked a handful of well armed guards. The Marquis de Launay, fearing a growing anger among the revolutionaries, glibly agreed to meet some of their representatives inside the prison. He hoped to buy time, as he was expecting a rescue team to arrive shortly and to help him secure his castle. But the negotiations ended when a group of revolutionaries entered the Bastille. The guards were ordered to fire, killing hundreds of people. The path of the revolt completely changed when the rescue team showed up and decided not to fight against, but rather with the mob. With their canons and their professional soldier skills, they brought victory to the people of France against Louis XVI’s guards in a few hours. At 4pm, the Marquis de Launay surrendered and let the people enter the Bastille. The guards were violently killed and the Marquis de Launay was beheaded, with his head then put on a stake and carried all over Paris as a sign of victory. That very night, the Bastille was destroyed. Some historians found the diary of the King. Of that day he wrote simply the word “Nothing”, which was the result of his day’s hunting. When the Duc de Liancourt informed Louis XVI of what happened at the Bastille, the King asked his adviser, “is this a revolt?” and he was answered, “No Your Majesty, this is a revolution”. 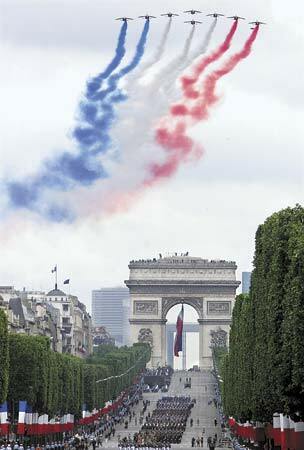 This story really helps to explain the French people and the importance of symbolism. There is no greater French symbol than the Tour de France. Le Tour is a rolling metaphor, encircling France every July, as a reminder to all what it means to be French and what it means to be free. Thank you for sharing! I read the quote from somewhere and been looking for it everywhere.